A loving welcome to Nicole Panzer of Lila Yoga Therapy Health & Well-Being for all! Yoga Teacher and Dorn Treatment and Breuss massage therapist, Nicole Panzer is based in Cape Town and has dedicated herself to consistent learning through the years to bring therapeutic and transformative healing to practitioners of all ages, from children to adults. Lila Yoga Therapy offers children & pre-teen Yoga, Pre & Post Natal as well as Adult Yoga classes and Dorn & Breuss treatments. 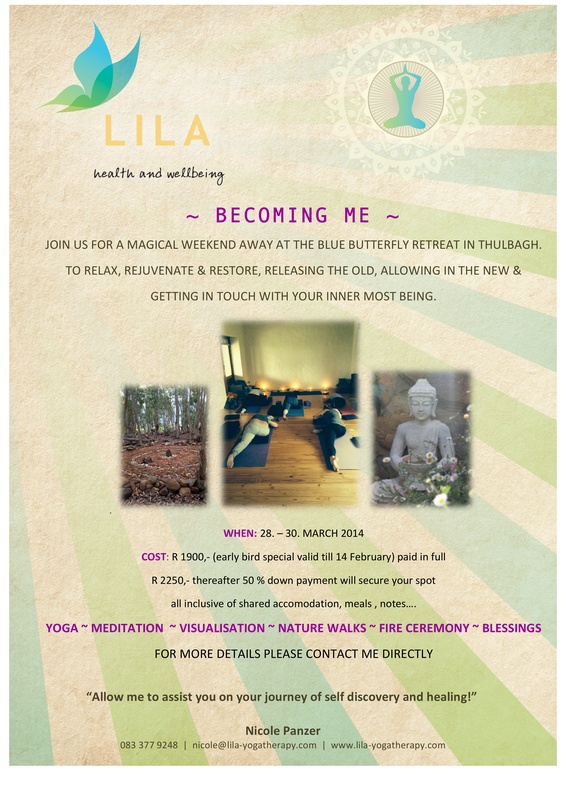 Nicole hosts retreats to nurture and revitalize from within and the next retreat is “Becoming Me” from the 28th – 30th March 2014 at The Blue Butterfly in Tulbagh. The last retreat, based on the same program, was such an amazing success that it deserves to be held again for others to experience the joy! Do yourself a favour and allow Nicole of Lila Yoga Therapy to guide you on your path of positive transformation – just like the beautiful evolving journey of a butterfly! ← Upcoming Teacher Training Courses for 2014 with The Southern Africa Yoga Centre – Yoga Alliance UK accredited.